When parents claim their children could run before they could walk, that’s usually an exaggeration, but when the child is K. Golden Harper (BS ’09) and the parents are Cheryl Howlett (’82) and Kenneth “Hawk” D. Harper (’87), the story is probably true. That changed, says his mother, when the toddler spied some children in the parking lot where they lived. He stood up, ran to play with them—and hasn’t stopped running since. Because his parents are also avid runners, he spent his childhood darting through the mountains near their Orem, Utah, home, where as a family they explored the scenery and often chased deer and jackrabbits. Within a few years sisters Amber Harper-Andrews (’07), Krystal, and Summer joined him. Popular or not, the family genes, lifestyle, and business have led each of the Harper children to be involved with running in a variety of ways. Eighteen years ago Hawk and Cheryl established Runner’s Corner, then an actual small corner store. 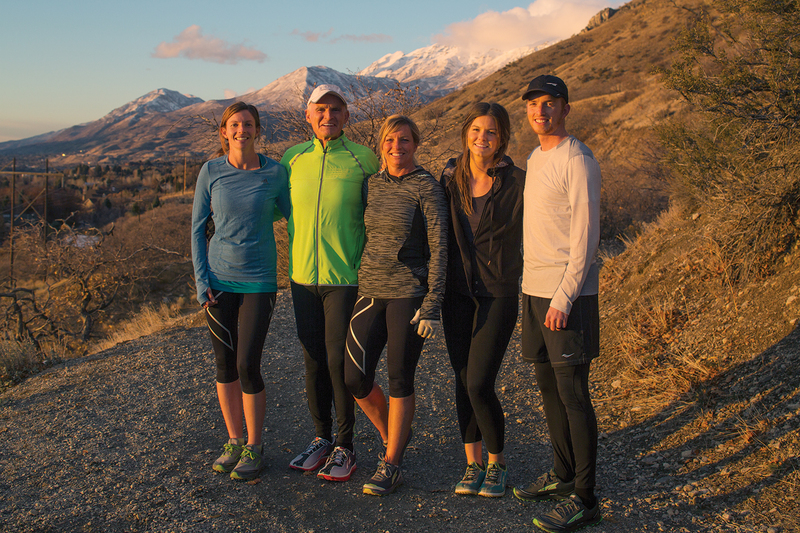 It quickly became the go-to place for Utah Valley runners seeking out shoes, gear, and training tips. To help make the store viable, the entire family became involved in the business, and Golden and Amber added to their experience by studying exercise science at BYU. Runner’s Corner has since upgraded to a larger building, and in addition to selling all things running-related, the Harpers use their facilities and tech equipment to offer clients feedback on their running technique. Above everything, though, the Harpers have found time to run and race and win. Cheryl, who held Utah’s marathon record for nearly 20 years, has won two St. George Marathons and qualified for five U.S. Olympic Marathon Trials. Hawk has won nearly 80 races, including one St. George Marathon. Among their children’s honors are state cross-country and track titles—Amber alone won 12 state championships—and national rankings. Golden, who holds the world’s best time for a 12-year-old in the marathon at 2:45:34, also won a 10,000-meter conference championship at BYU–Hawaii before he transferred back to BYU. The Harpers are competitive, no doubt. They’re also resilient. Golden is an avid snowboarder, but a serious accident two years ago took him out of active snowboarding and running. As he slowly healed, he decided he would become the first person to run to the top of all the 11,000-foot mountains in the Wasatch Mountain range. His girlfriend, Brita M. Ball (BS ’08, MS ’10), joined him for several summits. The Harpers (from left, Amber Harper-Andrews, Hawk, Cheryl, Krystal, and Golden; daughter Summer is on a mission) have made running a family affair—and a family success story. To look at the Harpers with their taut, wiry figures, one could surmise they automatically had runners’ bodies, but Hawk disputes this assumption. When he first decided to run, it took him four or five weeks to even run around a block. With persistence, that block became several, then several more, and by the end of a year, he managed to finish a marathon—and would complete two more in the next three weeks. Another bonus: he had lost 100 pounds. They married and, not surprisingly, ran on their honeymoon—an estimated 100 miles—and over the years they have planned vacations around runs. Through years of observing runners at their family’s Utah athletics store, Kenneth “Hawk” D. Harper (’87) and K. Golden Harper (BS ’09) noticed some consistent problems. First, many were cramming into shoes that weren’t allowing their feet to naturally spread out. So Hawk and Golden recommended people purchase larger shoe sizes. Second, nearly 80 percent of runners, they found, were overstriding, or hitting the ground too far out in front of their bodies, leading to a high-impact heel strike and a high rate of injury. People running barefoot naturally corrected the problem, but when they wore traditional running shoes, their poor form returned. Concluding that one culprit might be shoes with heels twice as thick and twice as heavy as the front, Golden began experimenting in his basement, putting shoes in the toaster oven and heating them until the glue melted. He would peel off the rubber, reduce the foam cushioning, then reglue the rubber. He called his new design “zero drop,” which means that the shoe cushioning does not slope from the heel down to the forefoot. The flat base helps minimize overstriding. 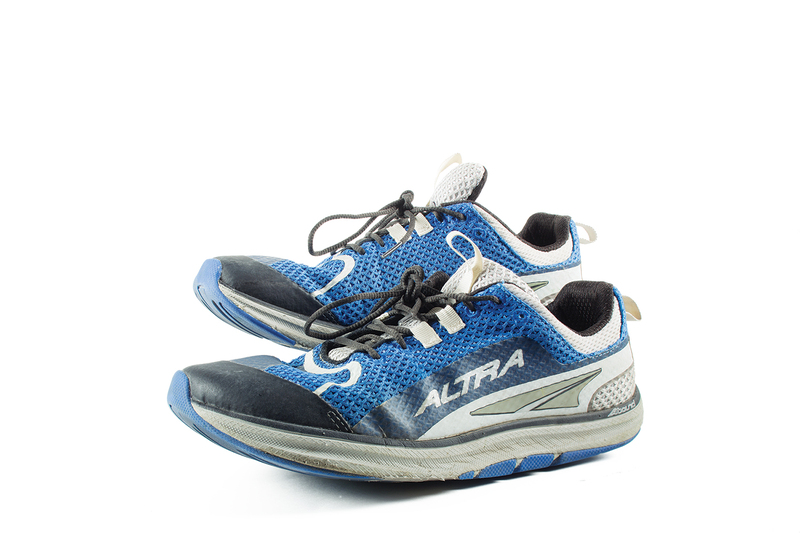 Golden also widened the shoe’s toe box to help runners stabilize and relax their feet. A group of shoe developers who had previously worked for Nike and Adidas helped Golden build prototypes, and the first Altra shoes were released in early 2011.